Monterey Seabirds features year-round pelagic trips for observing seabirds and marine mammals of Monterey Bay. Our experienced trip leaders and skipper, boat, and policies will all contribute to your enjoyment of a safe, comfortable and rewarding trip. Monterey Seabirds specializes in pelagic seabirding trips out of Monterey only. Our leaders/spotters will be fresh rather than exhausted from driving to Monterey the night before from other pelagic trips in Northern California. Most of our leaders are friendly residents familiar with local sightings and hotspots and willing to share this knowledge with our participants. 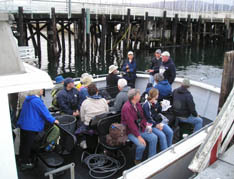 The 55-foot Point Sur Clipper is used solely for natural history outings and has seating for 40 people and a capacity for 48. There are no bait tanks to block access and no leftover fishy smells from fishing charters. Monterey Seabirds limits group size to 32 people per trip. This ensures the comfort and safety of all on board and makes it possible for everyone to see the birds without having to jockey for position at the rail. Our trips are the best deal in the business. At $125 for the regular outings and $160 for the 12-hour offshore outings our trips are priced to be affordable. If you go on three of our trips in a given year the fourth is free (NOT redeemable on the 12-hour offshore trips). We maintain regular business hours 7 days a week (Monterey Bay Whale Watch). When you call to make a reservation or ask a question your call will be answered by a real person. At Monterey Seabirds you can reserve your spot with a credit card over the phone or by registering online. Should you need to cancel your reservation and do so two weeks prior to your scheduled outing you will be refunded in full. If you would like to reschedule you will not be charged a fee. I was on your trip on May 15, and my compliments. I've been on several Atlantic pelagic trips, but yours was more fun. Partly because all the birds were new, partly because the weather cooperated, but also because the staff were very friendly and helpful. All best wishes.